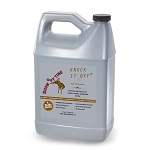 Knock It Off™ is an effective all natural fly and tick repellent for your horse. It's combined with selected biological oils and extracts and does not contain any pesticides. It's easy to use and is non-toxic. It really works and has a pleasant fragrance. Did we mention it repels against mosquitos as well!